Instagram Message: There I am, snug in my security blanket with Bruin by my side. Blankets rule! I have literally been sleeping like a baby lately. Even though the temps have risen (above zero and even up to 60 degrees! ), I still fall fast asleep snuggled in the best blanket I have ever had. My mother-in-law gave my hub and I matching blankets for Christmas two years ago. When we first received the gifts I thought they were a bit extravagant plus I felt bad because we already had so many blankets. Since the hub and I weren’t really using them at first, our kids decided to use the blankets. I noticed how soft and warm the blankets were after a few nights of tucking the kids into bed and I realized that I had to get them their own blankets because I wanted ours back! That is the story of how an extravagant gift became a thoughtful pinch. To me, the blanket is like a hug that settles my mind and puts me in a position so that I can feel the comfort that it was made to provide. 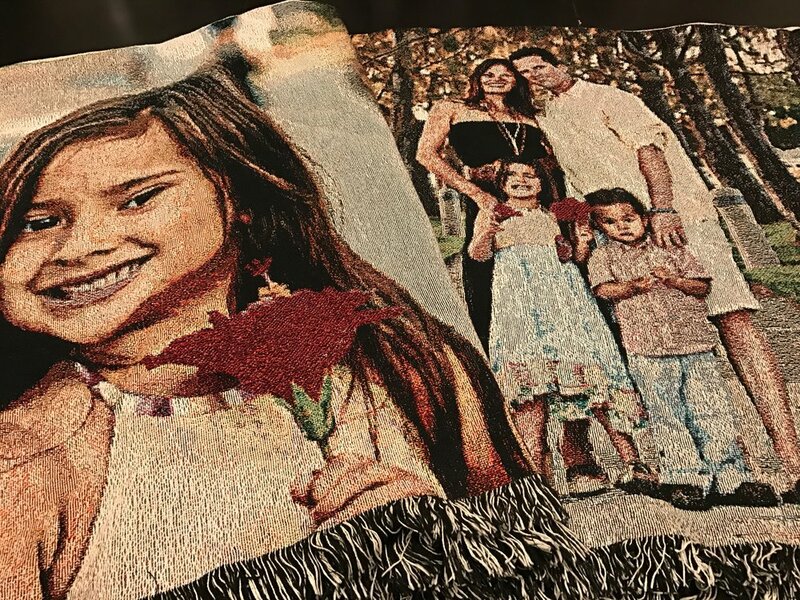 I am addicted to these blankets and if I was Oprah, they would definitely be on my "Favorite Things" list that I would give away to hundreds of people. We have two of the blankets in this dark color, a white one for my son and a light brown one for my daughter. The kids' blankets are not photographed because both kids are asleep with them right now. Restoration Hardware. Throughout the years, especially when my kids were born, we received lots of blankets as gifts. 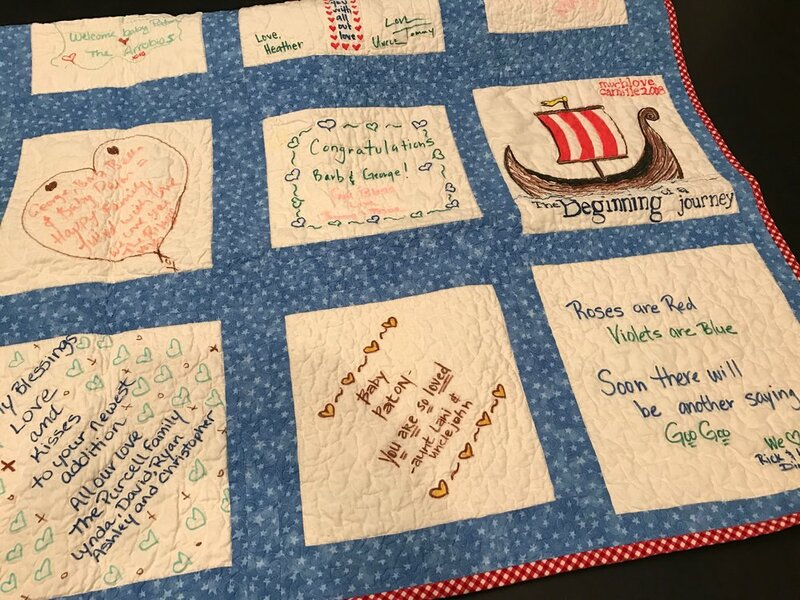 I love the sentiment of each blanket and I find it hard to part with one whenever we have to purge, like during the Spring Cleaning Season. I can hardly stand giving away a homemade blanket. I admire it when people can knit or crochet a blanket to give as a thoughtful pinch. When I am finally able to sit still, I picture myself making blankets for loved ones. Even though I admire quilters, I am pretty sure that I will never be a quilter. Let's be real, I picture myself hiring someone to make quilts. Hub's Nana had the quilt on the left made and gave it to my daughter when she was born. The pink and brown crochet blanket was handmade by the mother of my friend Renee who gave it to me at my baby shower. My in-laws rock. First they threw us a couples baby shower when I was pregnant with our son. During the shower they had friends and family use fabric pens to write on square pieces of cloth. Then my sister-in-law had the quilt made with those special pieces of cloth. As soon as we received it, I hung it up in my son's room for all to see. We will cherish this quilt forever. This quilt hung on another wall in my son's room. I remember when I nursed him, I would read the words out loud and hope that he was listening. This was a generous thoughtful pinch from his Godmother, Pauline. More sentimental blankets for my son: the blanket on the left has a hood and was from a BFF, Kristin. The football blanket on the right served us very well as our official stroller blanket and it was a gift from another BFF, Klaudette. It seems like he's more attached to it now then he was as a baby because, well, football. She gave a matching burp cloth too. And then you have the picture blankets. Isn't it amazing how technology just steps up and knocks one out of the park? For the past two Christmases, The Vikings have given the hub a blanket as well as a whole bunch of other things. But these blankets make very cool thoughtful pinches. 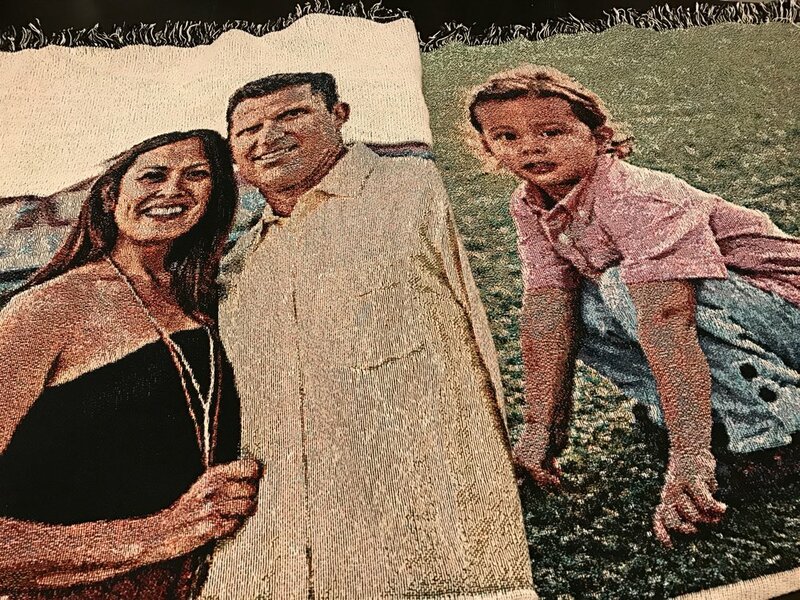 My brother and his wife gave us the picture blanket below years ago. Whenever the hub has to go to camp, I send the blanket with him so he can always have us near when he's away. The blanket has a dual purpose - it keeps him warm in the air conditioned dorm room and it's like having a framed picture of his family so he doesn't forget what we look like. This next blanket, I thought, was my grandfather's but it turns out my parents bought it in Canada years ago. I must admit that it wasn't a gift. I took it after one of my many trips home during college and never returned it. I've had it for years. The blanket is still in excellent condition and I now have it as sort of a focal point in our basement under the tray that carries the Xbox controllers. In other words, it has prime real estate in our home. If you zoom into the tag you will learn that the company that manufactured it, took full pride in what they made. Nowadays, there is a company, Faribault Wool, that makes blankets right out of MN that look just like this one. They also carry more updated and current looks that fit today's decorating themes. I just recently told my kids the reason why it irks me to no end, when I see that they have carelessly left a blanket on the floor. If they didn’t think I was a germ-a-phobe before the talk, then they do now. I explained that when people use a blanket, whether to keep warm, to relax, to cover up your pjs (or lack of) - whatever the reason may be - the one thing they are seeking is security. Secure warmth, secure self esteem, secure comfort. How would they feel if the blanket they were wrapping themselves in had bugs or dirt on it? Gross, right? You think they would get the picture but alas, the cozy blanket (that was not a gift but bought for pure aesthetics) is found laying on the ground in between the couch and the Xbox controllers. One day it will click. I’m hopeful. I can handle it only because it wasn't any of our security blankets that I just shared with you.